I am one of those people that always has some form of technology close to her whether it be a camera, a smart phone, a laptop, or a kindle. I read, I write, I shop, I socialize, and much more but since I started blogging this has taken me on to a whole new life online. I know bad mommy alert! 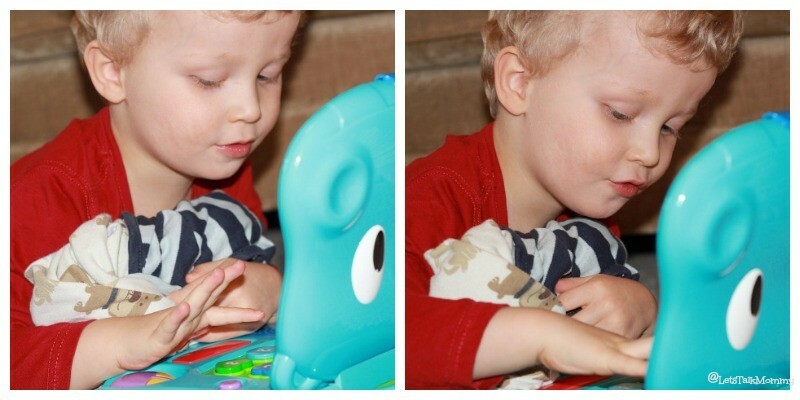 So when Buba got his own toy laptop I couldn’t help but notice him pretending to type away on it, in deep concentration, like his Momma. I asked him what he was working on, he replied, “I am just working”. It’s ever so cute to watch him sit and play make believe on his toy laptop, telling us all to shhh he is working. (I have never said this to him btw). You can even hear him chatting away to his laptop and nodding his head up and down to whatever he is working on. Then he will run over and show me his masterpiece, “Mommy, see!” Proud of his fake screen project. His imagination is growing along side of him and his creativity is shining through, it is so fun to watch. Missy Moo is now sitting up! I can’t believe how much she has come on in the last week. She is almost crawling, and getting the occasional scoot backwards. It’s amazing how much a baby can learn and do all in one week. Her new favorite pastime is helping Mommy with laundry, playing in the laundry basket and throwing all the clean, folded clothes out of it. It’s really helpful, especially if her brother is trying to throw them back into the dryer at the same time! Laundry time has become a family effort to not get it done! That’s my story and I am sticking to it. These are such lovely pictures! You’re doing a great job with the camera. I loved the moments when my boys played independently too. They grow so quickly! Thank you Emily that is sweet of you to say. I do have a long way to go in understand all the modes and settings!!! They definitely grow up way too fast. I feel like I am missing it because it’s flying by. Hahahah Oh Lucy you just made my day!!!! 😉 Something my toddler or mr p would say! hahahaha Sometimes it’s just needed. Thanks for popping over and commenting. Ahhh Jenny these are such sweet photos!!! I love your little guy being so engrossed in his ‘work’! 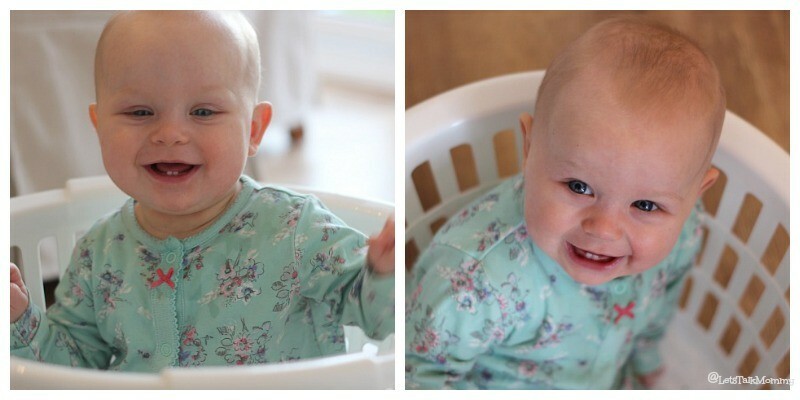 Little missy moo is adorable, i love her little top in these pictures! Thank you Suzanne. Me too, it’s a great way to cherish the little things that happen each week with our kiddies that we might not think are extraordinary but still worth remembering and recording. Thanks Katie. I completely agree. I think it’s important to have time to explore and be creative independently. I love watching them to see what they come up with to entertain themselves. A tag on a toy could entertain Missy Moo forever. She is always so smiley I love it. Buba concentrates more and gets serious when he is playing alone. It’s funny. Aww so sweet! I love it when little ones start playing at being Mummy and Daddy. At the moment Kitty likes playing being Mummy a lot, which is turning out to be rather revealing! Oh dear, hahahaha that’s funny Carie. Buba definitely likes to be Daddy’s shadow. Thanks Carin. I know I was mortified although I have never said shhh I am working that was funny! 😉 They are getting very good at playing and being independent.